Sick of shoveling and scraping the car? We hear you. And we have the ideal solution. A vacation to some of the world’s best beaches in Hawaii, Mexico and Tahiti. Book by February 14 and save up to $200 with promo code BEACHDEAL1.1 Take that winter. PS: Interested in Cancun? Check out our Cancun-specific deals. As the official vacation brand of United Airlines®, you'll receive the guaranteed lowest airfares on United® flights and the ability to book your trip for as little as $200 per person. Plus, you’ll get complimentary checked bags and priority boarding when paying with a UnitedSM Explorer card. Amidst impressive Mayan architecture, lush landscaping and resplendent ocean views. Combining today’s modern comforts with the architectural flare of the ancient Mayans. Separate from the everyday and discover an adults-only enclave of calm, positioned along the very edge of paradise. A beachfront resort where couples, wedding parties and honeymooners savor a Karisma Gourmet Inclusive® Experience. An oceanfront sanctuary of luxury and sophistication awaits you at Haven Riviera Cancun. Four pristine swimming pools offer dedicated family-friendly and adults-only options. Stunningly situated in the heart of Cabo San Lucas, minutes from the excitement of the city. This iconic property in the 'Heart and Soul of Cabo' has a beautiful pristine beach, 4 pools, and a variety of restaurants and bars. The Hotel Riu Palace Baja California is located in front of the heavenly El Medano beach, on the south of the Baja California peninsula. An enchanting oasis of natural beauty and relaxation, this first class boutique resort appeals to couples, honeymooners and luxury travelers alike. Breathtaking beauty while adding an air of luxurious transcendence to the experience. Enjoy unbeatable experiences at the Crown Paradise Golden All Inclusive Resort, for adults only, in Puerto Vallarta, Mexico. Combining charming Mexican architecture, distinctive ambiance and state-of-the-art accommodations. Sheltered by the famous spectacular Sierra Madre in a sophisticated area with its own natural reserve and panoramic views to the sea. The ultimate in romantic all-suite accommodation, this refined Adults only resort offers Unlimited-Luxury® with limitless gourmet dining. Dazzling white sandy beaches and the Palancar and Santa Rosa Wall reefs beckoning offshore make Cozumel a diver's and nature lover's retreat. Surrounded by luxury pursuits including stables, polo fields, a marina and golf course. Set in a green tropical paradise that faces a pristine beach and turquoise waters and is a secluded haven. Offering its guests a lavish experience of limitless gourmet à la carte dining and top-shelf drinks. Fronting an expansive stretch of sugary white-sand beach, families, golf-lovers and honeymooners are treated to rock star amenities. Located on the seafront overlooking the idyllic beaches of Punta Cana, this exclusive Caribbean resort features incredible water attractions. Situated on the beach at Uvero Alto, in one of the most beautiful coconut groves in the Caribbean. Cap Cana is an ecologically pristine, 30,000-acre exclusive retreat featuring white beaches and turquoise sea. Located on the northern coast of the Dominican Republic, in a world of beaches and tropical jungle. Where romance and relaxation greet every Jamaican dawn, this picturesque, all-suite resort offers the ideal setting for tropical getaways. Set alongside a mesmerizing clear water beach it's the perfect place for an adults-only vacation experience. Surrounded by lush gardens, state-of-the-art facilities, a stunning white-sand beach and crystalline waters. This relaxing resort offer fresh accommodations, conscientious staff and endless activities. Centrally located in Ocho Rios, the Moon Palace Jamaica Grande is near some of Jamaica’s most coveted attractions. Guests of all ages can get close to authentic Hollywood memorabilia and enjoy themed experiences. Offering spacious accommodations and stunning views overlooking Palm Beach and the high rise boardwalk, this opulent escape provides first class vacation experiences. Nestled against the Caribbean sands of Palm Beach, this oceanfront hotel offers modern, recently upgraded guest rooms and suites. Blending the finest amenities and activities with personalized service, this resort is a true island gem for families, spa-lovers and couples. Catering to spa enthusiasts and active travelers, this sun-sational beachfront retreat provides an endless supply of relaxation and fun. Meliá Nassau Beach is situated on a 1,000-foot stretch of white sand along the Atlantic Ocean on Nassau's Cable Beach. Warwick Paradise Island Bahamas offers the ambiance of a private escape for those seeking a modern, relaxed, and intimate resort. Fronting a wonderful stretch of Nassau's world-famous Cable Beach, this lively resort appeals to active travelers, couples and families with kids. Overlooking Puerto Rico’s famed Condado Beach, this relaxing oceanfront resort appeals to families, gaming enthusiasts, beach lovers and couples looking to tie the knot. Experience San Juan's newest urban retreat facing the Bay of San Juan. A truly remarkable landmark in the district. In the unique destination of Panama, guests can experience beaches, rainforest and mountains. Inspired by the lyrics and lifestyle of singer, songwriter, and author, Jimmy Buffett, it's a lot more than a world-class resort. Guests to this exemplary Caribbean resort experience the ultimate in relaxation and pampered luxury. Fronting Waikiki’s best beach, this unique getaway offers a wide selection of shops, nightly entertainment and award-winning restaurants. Aston Waikiki Beach Hotel exudes a hip Hawaiian sense of place just across Kalakaua Avenue from a prime stretch of legendary Waikiki Beach. With almost five miles of beachfront and one of the most mesmerizing settings in the Hawaiian Islands, Turtle Bay Resort is the perfect place. Situated on Waikiki Beach, featuring a selection of fascinating shops, restaurants and spa. Conveniently located on Kuhio Avenue, this hotel offers a comfortable selection of guest rooms. Bordering a pristine white-sand beach and the Pacific Ocean, this beautiful retreat offers premiere accommodations. The award winning Hyatt Regency Maui Resort and Spa offers unlimited activities and amenities in a setting of tropical luxury. Offering gourmet cuisine at the diverse offering of restaurants, exciting bars and a grandiose spa recognized as one of the world’s best. The ocean is everywhere at this newly remodeled luxury resort in the heart of Wailea near shopping and three championship golf courses. Set on the widest expanse of Ka’anapali Beach at the foot of legendary Pu’u Keka’a, Black Rock, this resort greets travelers to a world of relaxation and discovery. One of the best family-friendly beaches on Kauai, with Lydgate Beach Park adjacent to the hotel. Experience breathtaking tropical gardens, waterways, and award-winning dining and shopping at Hilton Waikoloa Village. This luxurious beachfront resort is nestled on 32 acres of sunny Kohala Coast at Mauna Lani. Set oceanfront overlooking Kailua Bay in the heart of Kona town, within walking distance of restaurants, shops, historical sites and activities. Located on Hawaii's famed Kohala Coast. The hotel fronts the white sands of Hapuna Beach, rated one of the best beaches in America. This Bora Bora resort occupies what most people say is the most beautiful site in French Polynesia. Paradise on earth is what this resort is all about. Set amidst the gentle beauty of the reef and featuring a spectacular view of Bora Bora's Mount Otemanu. 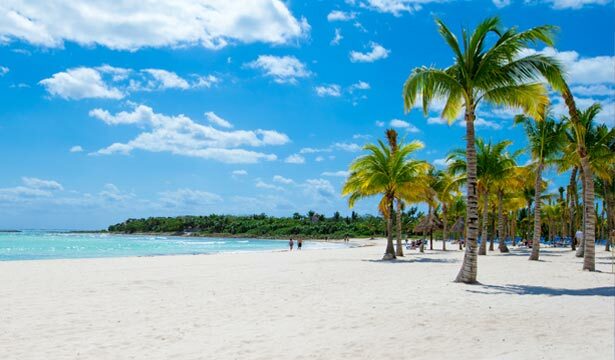 1Promo code BEACHDEAL1 is valid for travel 2/1/19 - 12/15/19 for air/hotel packages to Mexico (excluding Cancun), Hawaii, Caribbean, South Pacific, 2-night minimum stay required. Save up to $200 per reservation based on a 6% discount on the hotel portion of the vacation. Valid on new bookings made between 6 pm CST on 1/31/19 and 6 pm CST on 2/14/19. Must enter promo code BEACHDEAL1 at time of booking.